Jim Bryce Outfitting of Delta, Colorado offers fantastic hunting adventures for elk, mule deer and black bear. Jim Bryce Outfitting has been in business since 1980 and has the most experienced guides available. 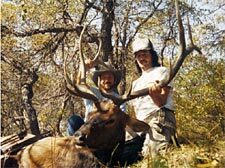 Our guided deer and elk hunts are on foot, horseback and 4-wheel drive. We will use whichever method or combination of methods that will be the most successful. The guides will hunt with you on private land, BLM land, and in the Grand Mesa National Forest. There is a point restriction on elk in this area and because of this; there is a better quality of big game animals to hunt. Elk have a four point restriction. There are a lot of black bears. The numbers of bear have gone up for the last several years. We have several color phases, blonde, cinnamon, brown and black. Jim Bryce Outfitting offers full service guided hunts, drop camps, wildlife photography, pack trips, and horseback rides. 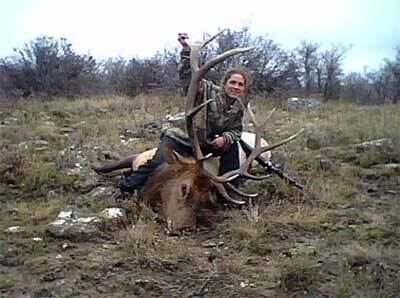 If you want to go hunting or just want a relaxing vacation to get away from it all, we will do our best to help you have the trip of a lifetime. We care if you have a good time. So give us a call and come enjoy some good ole fashion western hospitality, whatever your vacation needs may be. Jim Bryce Outfitting is one of the oldest established outfitters in Colorado. For more information on available dates and price quotes go to the Jim Bryce Outfitting web site below. To book a hunt now call: 970-874-4134 or E mail.